Nov 16, 2014 marked the day for these two lovelies to tie the knot. These gorgeous images are attributed to international photographer Helga Schaefer. What a show shoe shot! Say that three times fast! I always arrive early to build this driftwood arch and as I am most often contracted through a wedding planner, I rarely get to meet the couples. It’s great fun to have the opportunity to view their weddings and see how our handiwork spent the day interacting with these couples during some of the most memorable moments of their lives. So thank you planners and photographers who share your work with the world! 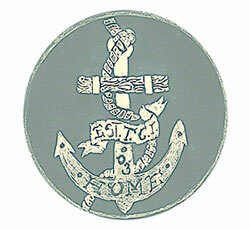 It’s special not only for family and friends afar, but also for the contributing vendors. 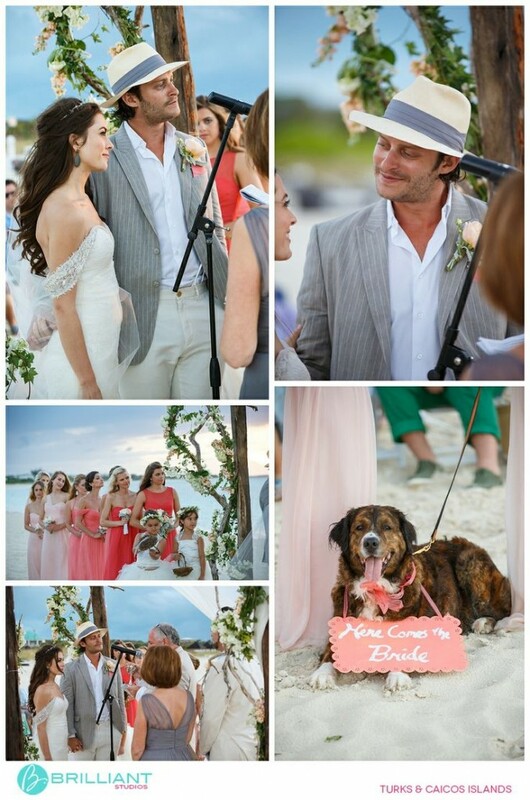 This entry was posted in driftwood, TC Millwork Design, wedding, wedding inspiration and tagged Destination Wedding Turks and Caicos, Driftwood wedding, Grace Bay Club, Helge Schaefer Photography on January 7, 2015 by pepperkeystacie@gmail.com. November 16th, 2015 was an unusually pale and blustery day in Turks and Caicos. Melissa and Chris didn’t let the lack of sunshine put a damper on their big day! Sometimes a moody sky and sea allows for a most beautiful portrait, don’t you think? I love this Brilliant Studios capture of the newlyweds under our driftwood arch. 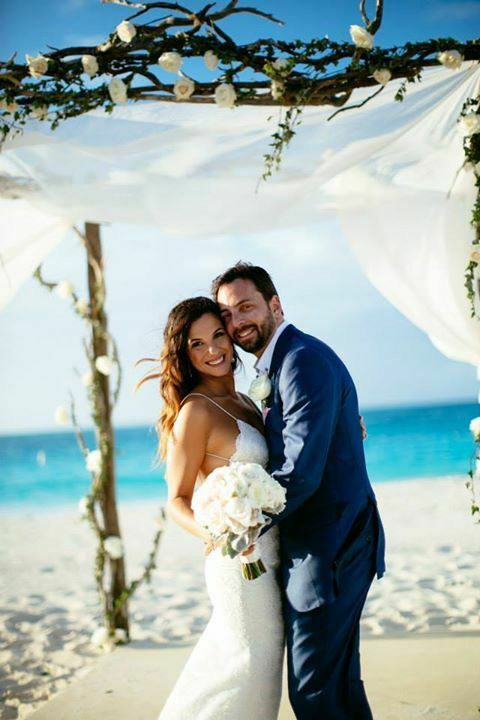 This entry was posted in driftwood, Styling Work, wedding, wedding inspiration, Wedding Styling and tagged Destination Wedding Turks and Caicos, Grace Bay Club on December 2, 2014 by pepperkeystacie@gmail.com. 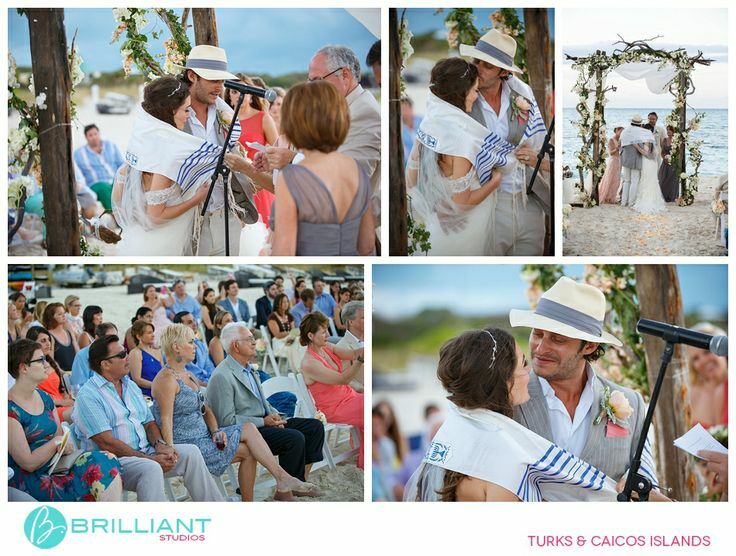 Tropical DMC planned this gorgeous May of 2014 wedding in at the Gansevoort resort. TC Millwork built the driftwood chuppah which Environmental Arts did a beautiful job decorating with climbing ivy and pale pink and white bougainvillea. David and Anita at Brilliant Studios did a phenomenal job capturing Ashely and Michaels big day, the image below is one of my favorites of this arch! Isn’t it magical? 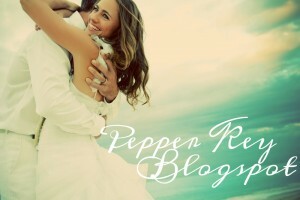 Head over to their blog to see more on this big destination wedding. 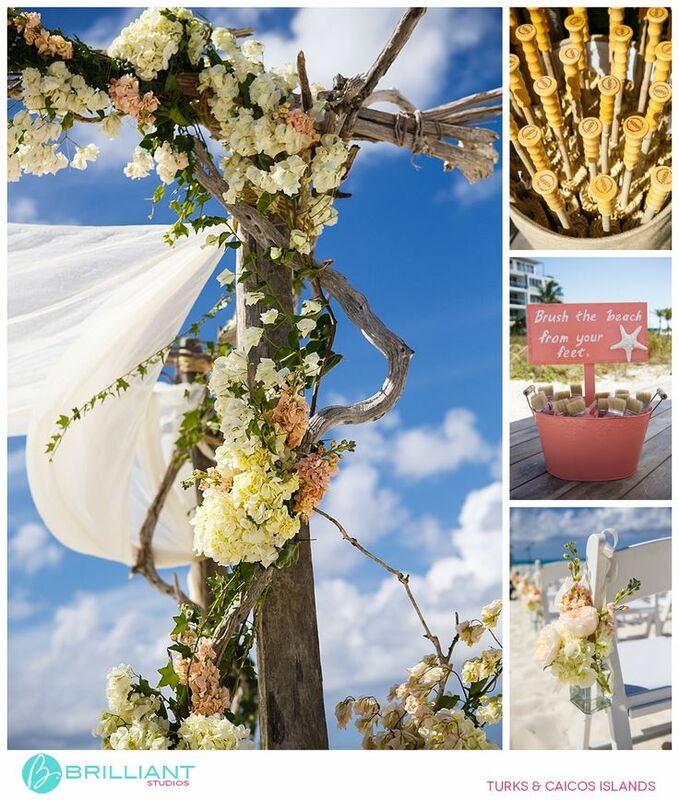 This entry was posted in driftwood, TC Millwork Design, Tropical DMC, Turks and Caicos Islands, wedding, wedding inspiration and tagged Brilliant Studios, Destination Wedding Turks and Caicos, Driftwood chuppah, Flowers by EA on June 24, 2014 by pepperkeystacie@gmail.com. Thrilled to have our Bohemian shoot featured on Rock My Wedding! Love that site, and their UK team who knows how to bring on the pretty party!! 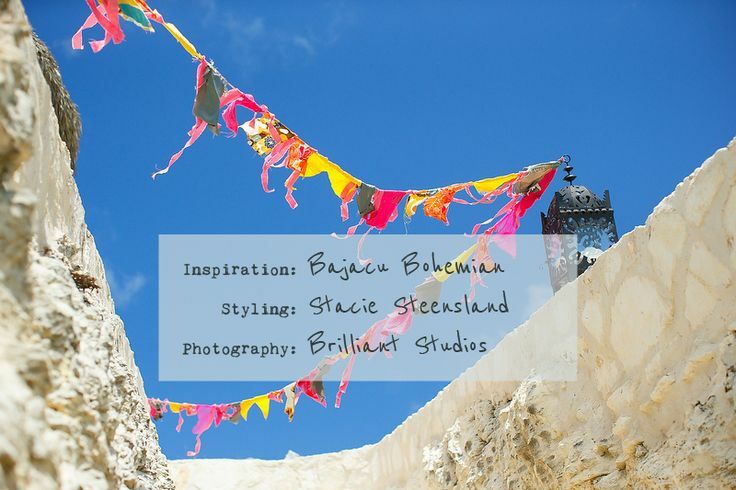 Please pay their beautiful blog a visit and be sure to check out our feature Beach Bohemia! 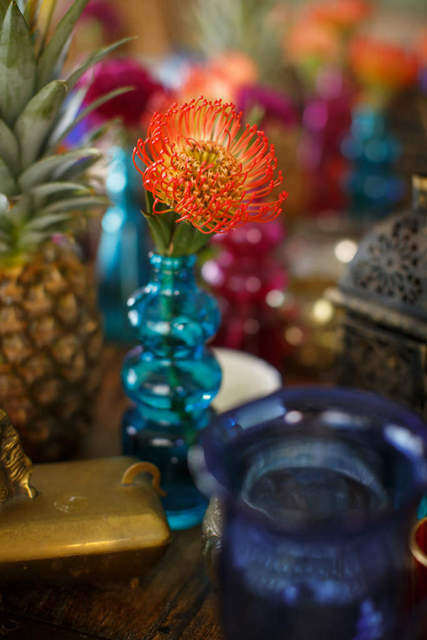 The “Bajacu Bohemian” styled shoot, as the name suggests, was very much inspired by the incredible venue. 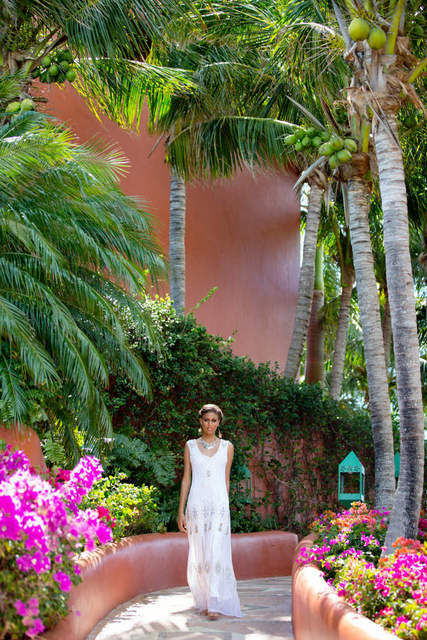 The elevated oceanside villa, and its designer, world famous architect Marco Aldaco, have been featured in many substantial books and such noteworthy publications as Architectural Digest. 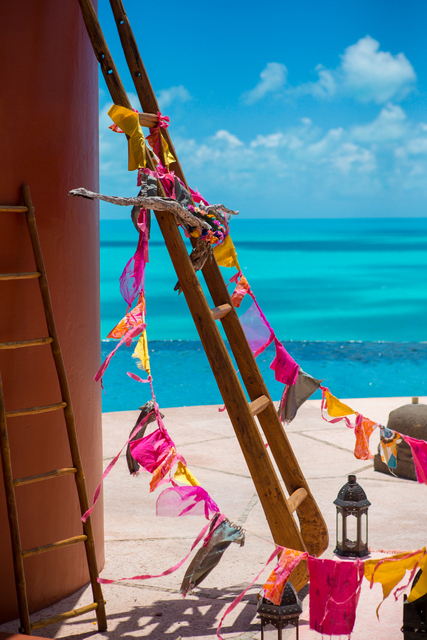 Bajacu literally “rising sun” in the native Caribbean Taino tongue, is apparent from the moment one sets eyes on the burnt orange exterior, set far above the surrounds on one of the highest perches on the island of Providenciales. The view, especially from the crescent shaped infinity pool which wraps around the giant central palapa, is made that much more spectacular by the 11 surrounding acres of lush tropical gardens thick with frangipani, jasmine, and countless coconut trees. 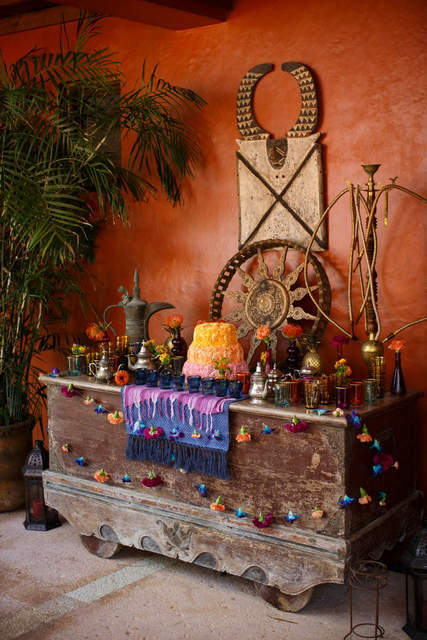 Antique furnishings from Africa, Indonesia, and Asia create a warm ambiance. 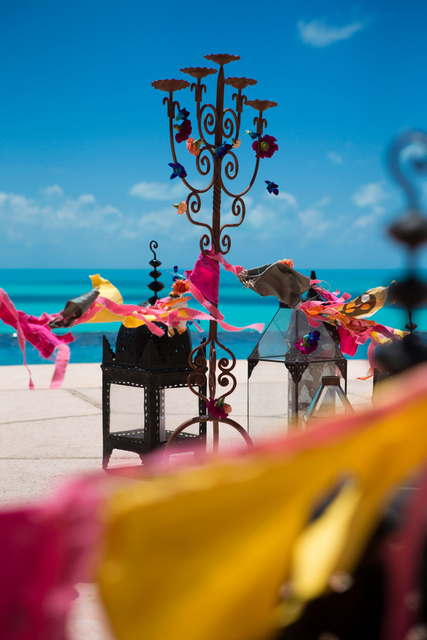 The global influences in the art, decor, and details give guests a taste of the world and so we wanted to incorporate that free spirited love of travel and all things rich in color into our concept. Our color scheme was richly saturated; pomegranate, watermelon, tangerine, golden yellow, and the infamous Bajacu burnt orange (and just about everything in between). 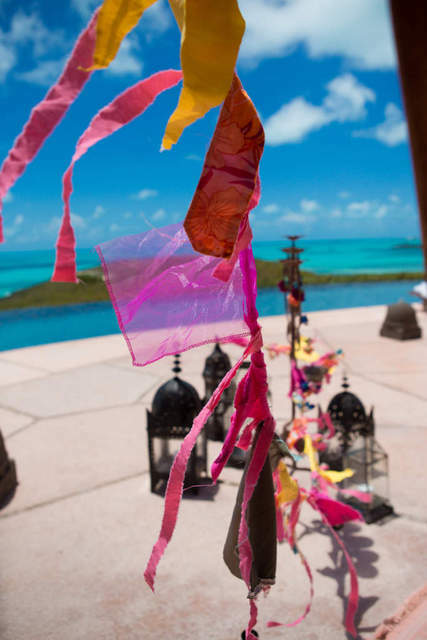 Dozens of dark metal Moroccan and glass lanterns in various shapes and sizes dotted the walkway to the sea and clustered around the ceremony site for a dramatic, exotic feel. 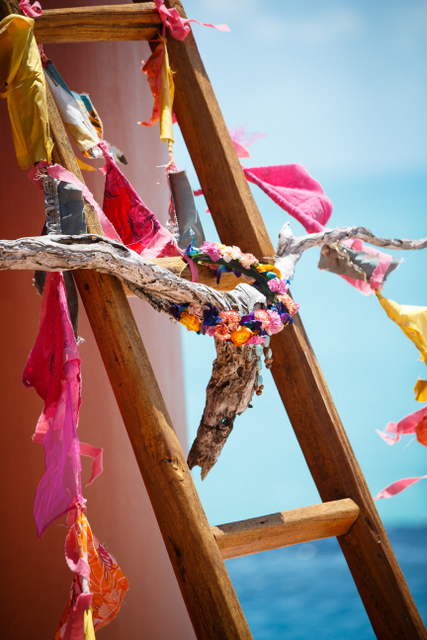 Bright gypsy inspired patchwork flag strands were hung to flap and flutter against the pure blue sky. 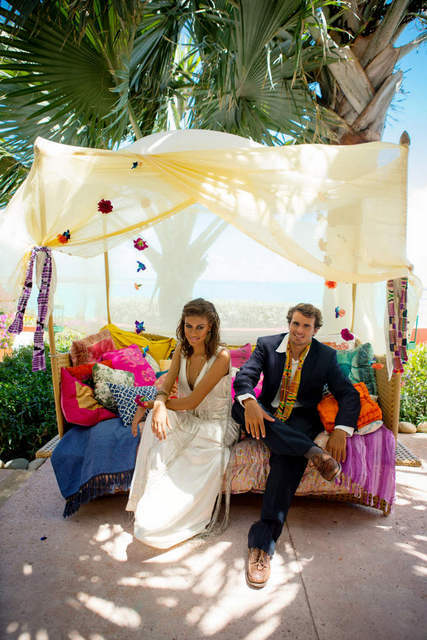 A kaleidoscope of patterned pillows made the canopied daybed extra plush and inviting as a newlywed nook. 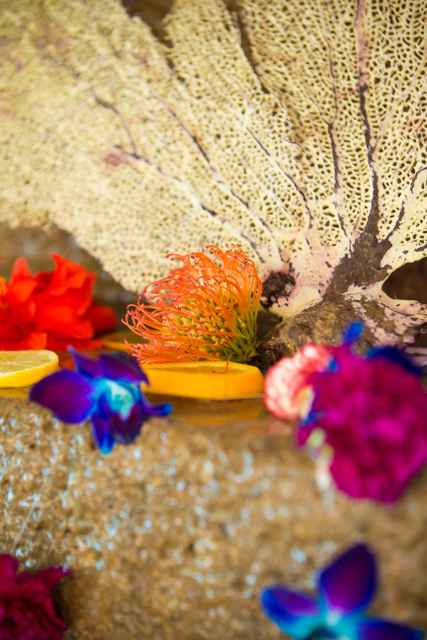 Bright yellow fan corals and citrus slices adorned the fountains and footbaths. Local florist extraordinaire Environmental Arts Pomegranate Proteas and and lime cymbidium orchids were the focal flowers of the bouquet and decor. 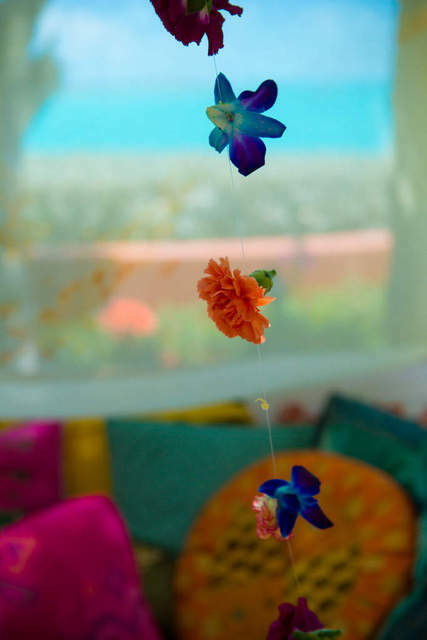 Tangerine, peach, and fuscia carnations were used to create Indian inspired floral garlands which were draped in long strands. The grooms lime green and fuscia centered cymbidium orchid boutonniere popped against his midnight blue blazer. A festive crown of colorful carnations and bright blue and purple orchid blooms was the perfect head to toe touch for our boho bride. 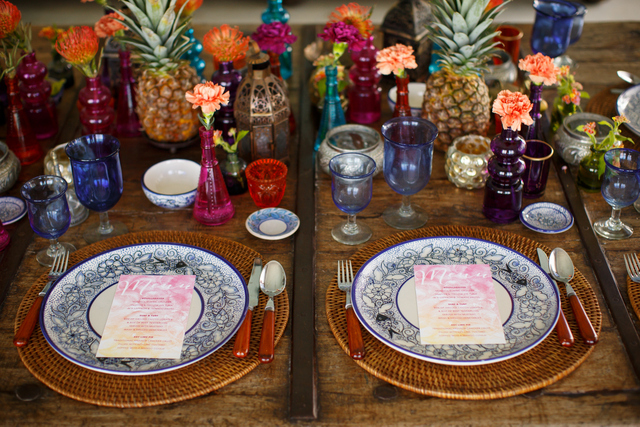 Single stems of all of the above and local lantana, which both looks and smells as sweet as candy, were centered in brightly colored glass vases for the tablescape. 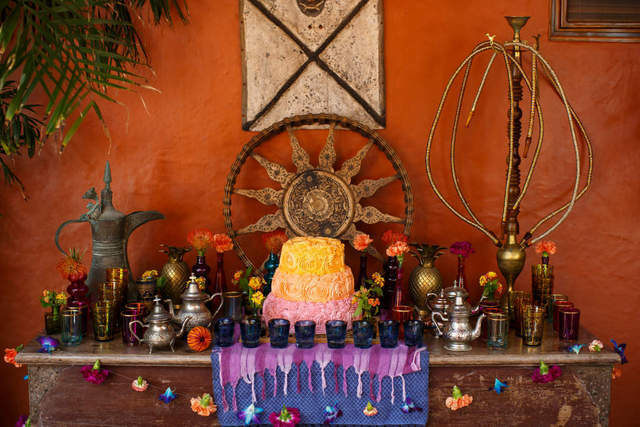 Our Turkish tea station, an antique chest draped in many patterned peregrine fabrics and florals, made a vibrant welcome for our boho wedding. Gold detailed Morroccan teacups, antique silver, bronze, and gold teapots, and blooms galore surrounded our mouthwatering cake by Diane Guess. 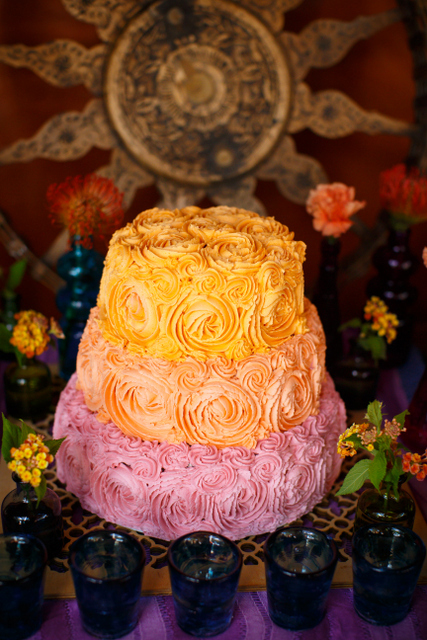 Loose wild rosettes in a watercolor wash down the three tiers mimicked the many shades of the “Bajacu” rising sun. The fabric flag strands were created using materials from the local thrift shop; skirts, shirts, and sundresses were cut into squares and alternated down the line with a few long strips to act as streamers in between. Mother Nature made the unbelievable driftwood “skull” which I adorned with a vivid turquoise and gold necklace to give a desert chic feel to the ceremony. 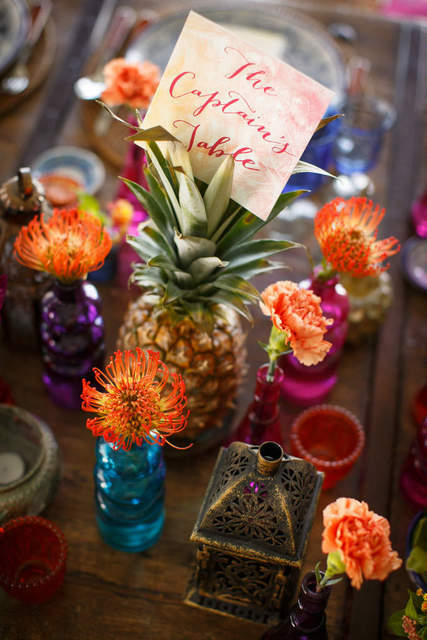 A traditional gift of Caribbean welcome is the pineapple so the exotic fruit acted as table card stands. A few pillow covers were made from the same thrift store fabrics as the flags for the canopied daybed. We wanted our bride to convey a sense of mystery in her beauty look, smokey eyes and windswept hair. Ann Clift Northcote of Beauty and the Beach created our make-up looks and Geraldine Burtschi of Salon Maxime styled the hair. Our three gorgeous gowns were provided by Luella’s Boudoir. Each exhibited a different take on bohemian; the plunging neckline dramatic floor length beaded gown, the metallic beaded sheath, and the satin cap sleeve long dress with draped back detail. (Details from Rachel) Our groom wore a midnight blue suit and crisp white dress shirt provided by Mr. Tux. Accessories for a boho bride make all the difference! The most elegant gown can be given an edgy twist with a little accessory finesse, which is exactly what we did with our three bridal looks. The sophisticated Great Gatsby-esque gown was already dripping with detail so we wanted to keep the accessories minimal to let the dress do it’s own shining. A bronze wrap around feather cuff bracelet, a long gold medalion necklace, and large but lightweight filigree drop earrings polished the look. The intricate sheath gown with silver, gold, and bronze beading was paired with dangling filigree gold earrings, a necklace (chanelle details), and chunky gold, silver, and vintage bronze bangle bracelet. 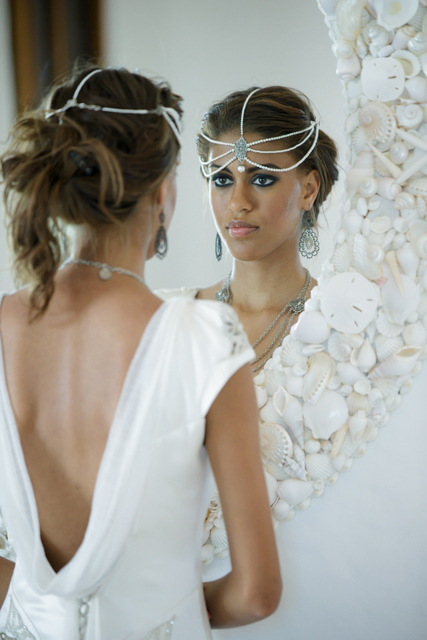 Our sleek satin gown was paired with a pearl headdress (Rachel details) and oxidized silver necklace. 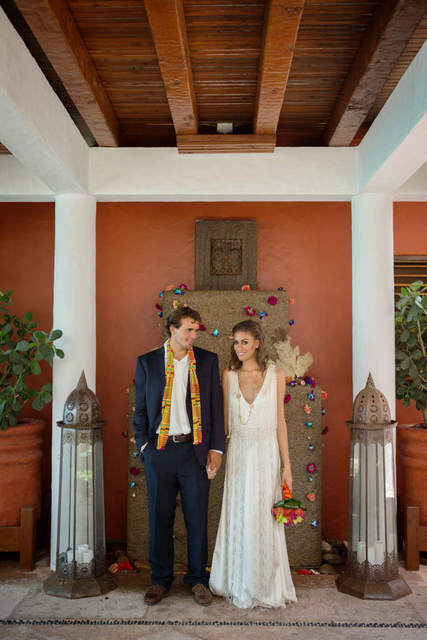 Our groom was accessorized with a woven red earth colored tribal scarf. 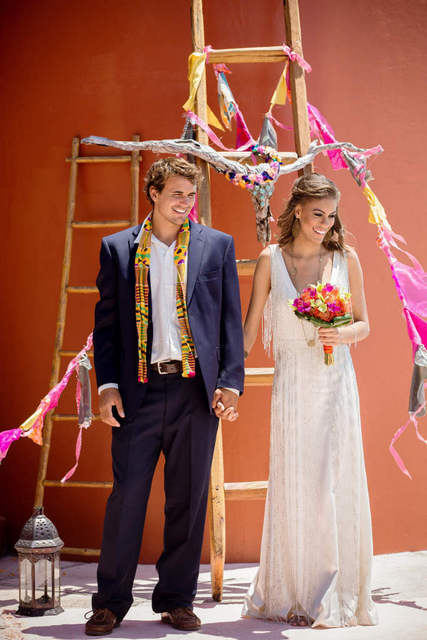 As one would expect with a gypsy inspired wedding, our bohemian bride and groom were barefoot! When choosing a venue take note of all the little details you love, perhaps a pair of potted plants in antique urns or an amazing velvet fainting sofa. With Bajacu there were so many details already part of the villa which were shifted around to add style to the overall look and feel; the Moroccan lanterns, the wooden leaning ladder for the ceremony, the glorious blue and white china for the tablescape just to name a few. Inquire with the venue management about those details you love. Can they be moved to your ceremony spot, can they grace your reception tables? Geting creative with what is already available is a nice way add drama without a dramatic increase in budget. Chanelle and I had such fun with this concept, lots of laughs having to help one another up from the floor set tablescape due to our heavily pregnant bellies at the time. 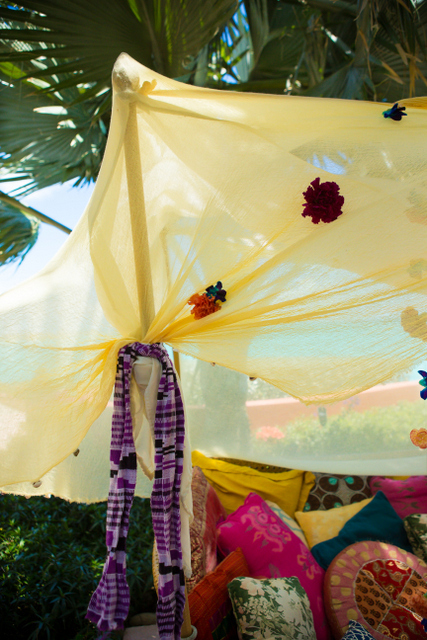 Big thanks to all the vendors who participated, you all made our punchy-colored-gypsy-vibe vision come true! Turks and Caicos really has the most vivid turquoise sea, come see for yourselves! 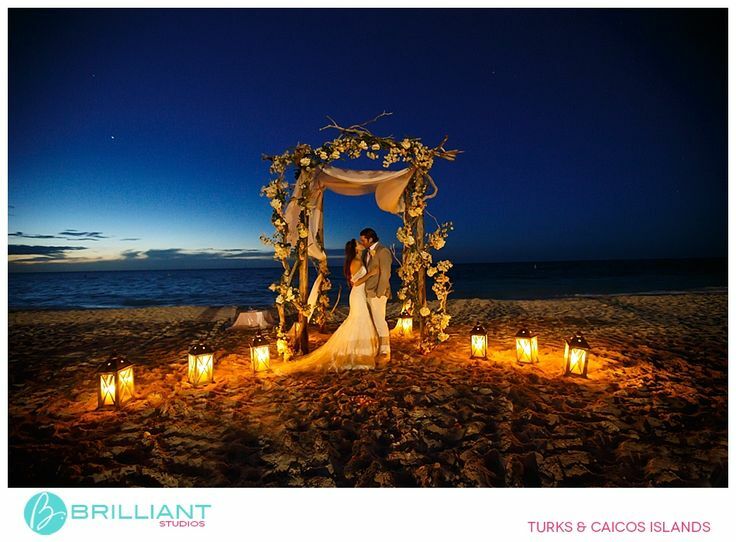 This entry was posted in Caribbean, crafts, Creative Work, decorating, design, DIY, driftwood, fashion, handcrafted, inspiration, jewelry, Lantana, Providenciales, styling, Styling Work, TC Millwork Design, Uncategorized, wedding, wedding inspiration, Wedding Styling, wedding tablescape, yellow on August 31, 2013 by pepperkeystacie@gmail.com. 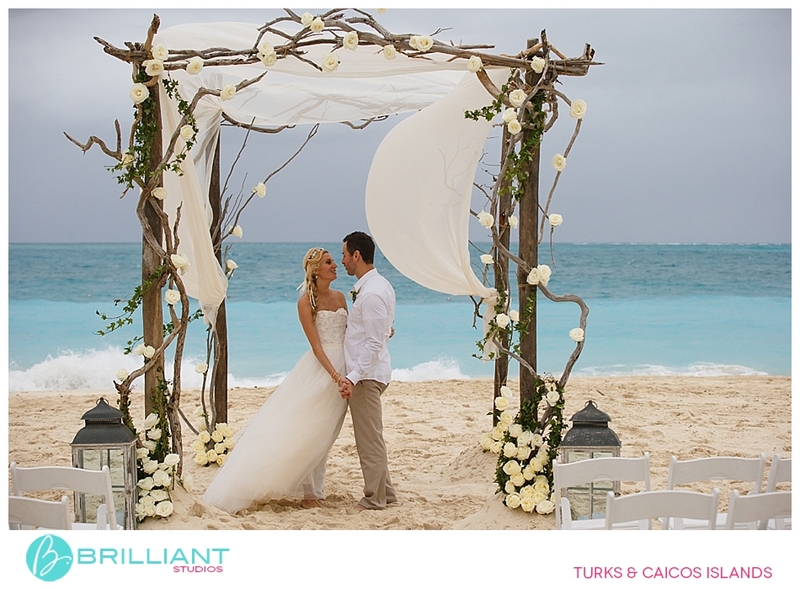 On August 3rd Tropical DMC contracted us for our driftwood tree arch for a wedding ceremony at the Gansevoort Turks and Caicos. 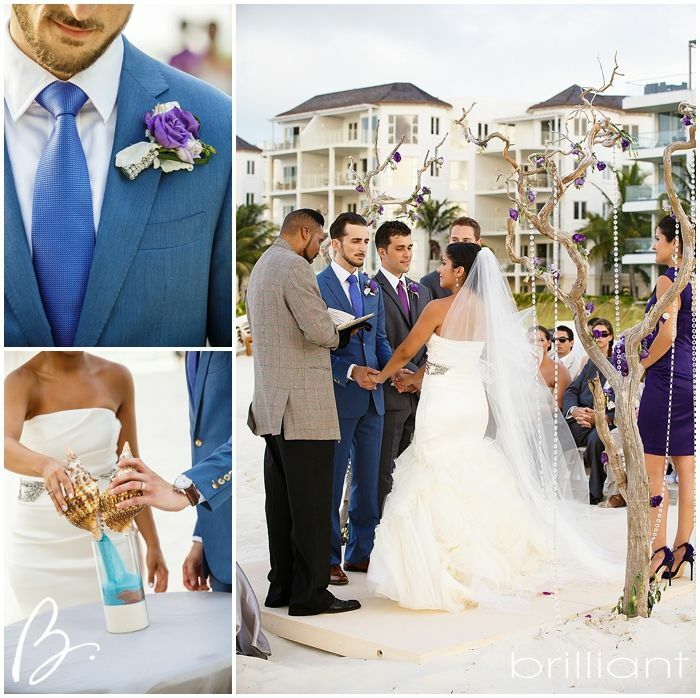 Deep purple is not a palette we see that often, Adriana and Philip you pulled it off beautifully! 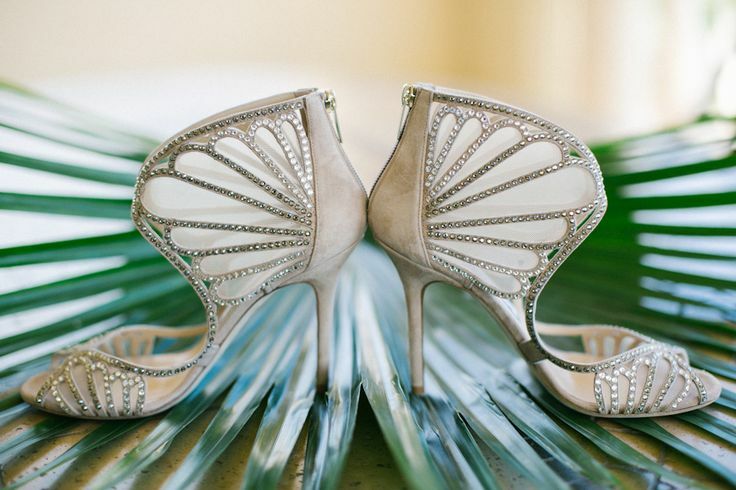 See the rest of this gorgeous glam wedding on Brilliants blog. 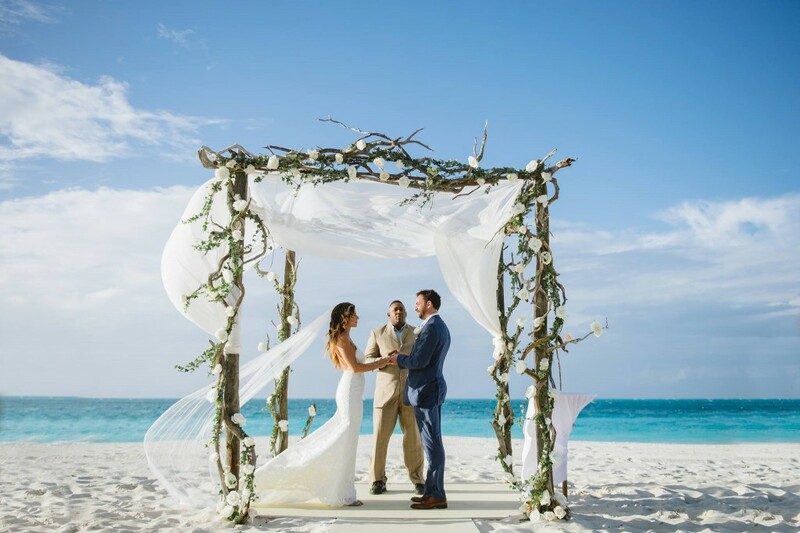 This entry was posted in beach, Brilliant, Caribbean, ceremony arch, chuppah, driftwood, styling, Styling Work, TC Millwork Design, Tropical DMC, wedding, wedding inspiration, Wedding Styling on August 17, 2013 by pepperkeystacie@gmail.com.